Meal Prepping Made Easy – This Girl Loves to Eat! I came across a post on Twitter last night that is so simple, I can’t believe I haven’t seen it dozens of times before! What is the one thing, besides tracking your meals and exercise, that all diets rate as a “must do” for weight loss success?Meal Planning. Hand and hand with pre-planning what you’ll eat and when you’ll eat it, is making sure the food you’re supposed to be eating is ready and able to be eaten with minimal fuss to keep you from resorting to fast or unhealthy food choices. Meal prep for the week is a great idea, but what is the most common complaint? Boredom. One can only eat so much grilled chicken! This brilliant idea from Fit Men Cook takes care of boredom without adding more than 5 or 10 minutes to your weekly meal prep time! 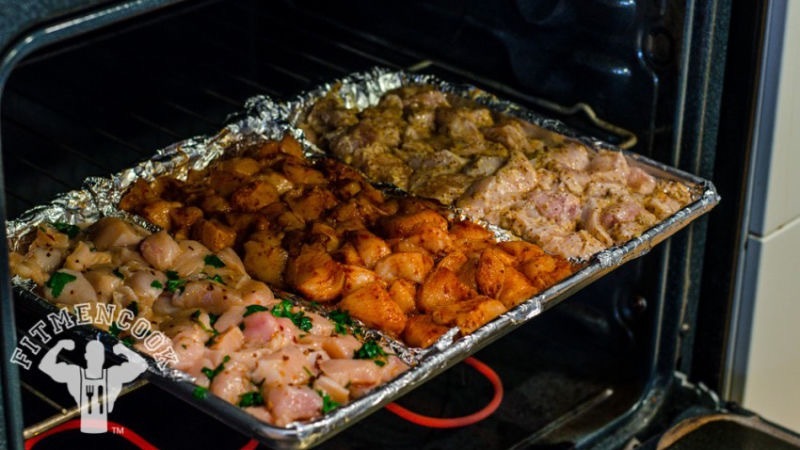 By simply using foil to create sections on a cookie sheet, you can create individually seasoned portions of the protein you’ll be adding to your lunches and dinners for the week and, by doing it when you pre-cook it, save time when you eat it during the week. You can create different salad choices, bowl themes, stir fry mix-ins, fillings for lettuce wraps, toppings for zucchini noodles, the options are unlimited. When you have a specific goal in mind (losing weight, adding muscle, or if you are an athlete) you need to consume specific amounts of protein. Meal prepping using a scale, sectioned cookie sheet for baking, and zip bags or storage containers, is a great way to keep you on track. Most of us need at least 50 grams of protein a day, and significantly more if we’re working out a lot or trying to lose weight. This graphic shows what 25 grams of protein looks like in a variety of foods, so you can eat a few of these portions and know you’re on the right track. Posted on January 13, 2017 by ls1228Posted in 30 Minute Meals, Baking, Dieting, Dinner, Good For You, Main Dish, Menu, Quick, Skinny, Tips & TricksTagged diet fails, diet success, meal planning, meal prep, portion control.